Oh, I did enjoy your post on the wretched Kilmeny and Eric! Until I did a bit of research I assumed this would have been a first novel, and Montgomery’s writing skills were honed by time and experience, and I was surprised that it was written after Anne. I’d still like to read more of her work, although I’m not sure where to start. And thank you for the mention – that’s very kind of you. Can I recommend the Emily books? Emily of New Moon is the first, and I did read them as a kid (so I’m biased), but I think they are pretty charming and great. I like them better than the Anne books myself. It does have a very “first novel” feel about it, doesn’t it? It’s so earnest, and florid in description, and – huge drawback – almost completely humourless. The characters move around like poorly handled marionettes, strings fully visible. The handling of Neil in particular irked me; he was cast as the complete & utter bad guy and he was otherwise completely undeveloped but for a few hints here and there; his only purpose was to move the plot along, the rest of the time I imagine him off in a corner moving in place with his “sullen scowl” like a mechanical toy facing a wall until picked up & turned around for a few moments action until spinning out yet again! But he couldn’t have been that bad – it was said that he was hard working and intelligent, was a welcome fiddle player at dances, had a wide circle of acquaintances – though the implication was that they were lower class, to fit his “peasant” heritage – he liked to go “down to the shore” which I read as a statement that he hung out with the fishermen, was fond of his horse and devotedly kind to Kilmeny … he is exiled after his last bit of action with nary a regretful glance even from his foster “sister”, and Eric is just plain smug about his (Neil’s) utter defeat in love & his banishment from the only home he’s ever known. Ick. I wonder whether this was a story idea that was resurrected from earlier writing days, due to the public demand for “more” from LMM due to the success of Anne? Her personal life was complicated and more than a little demanding; perhaps she thought this would be an acceptable “next novel” and fired it off without fully developing it due to whatever was going on in her world at the time? I have LMM several story collections which are a hodge podge of quite wonderful and absolutely dire – the dire ones being reminiscent of this novel – cardboard characters moving about an artificial stage with contrived motivations and actions. I haven’t read much LMM for quite a few years – though I did read Anne of GG quite recently (5 years ago, maybe) with my daughter, and it still very much held my interest – grand book. As far as other LMM reading, Christine, not quite sure what to recomend. Some of the Anne sequels are excellent, though a few are, in my memory, not quite up to par – they feel too quickly written which they prehaps were. The Blue Castle wasn’t too bad – terribly contrived plot-wise but rather a nice “light read” with a few surprises. I was going to say how right you are about Kilmeny, but then you said “not too bad” about The Blue Castle in the above comment, and I don’t even know what to say in response to that. The Blue Castle is so great! It’s so wondrous! She insults all her family members and runs away with a putative ex-con! But you’re right, Jenny. I quite like Blue Castle, the heroine is grand – had me cheering her on. Must find it & reread it, now that we’re all LMM-aware. Picked up The Blythes are Quoted recently – it’s still in my TBR pile but never quite makes it to the top. I dipped into it but lost interest. Not necessarily a judgement on the books if I can’t get into them, more like my personal concentration level & all the other grand choices piled all around. 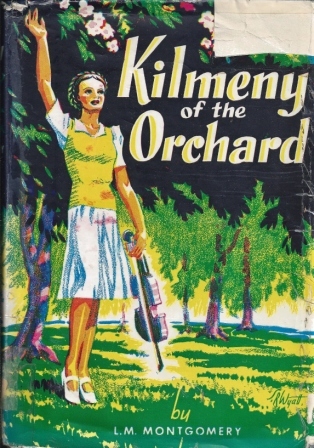 Ah yes, Kilmeny of the Orchard. Like Nicola, I read it once back in my dewey youth, and loved it. I even recall writing a glowing book report for a school assignment. And never read it again, despite many rereads of other LMM books. Then, about 2 years ago, while reading the LMM journals, I picked it up again, and could only only be astonished and appalled that I’d ever found it charming and uplifting. Sentimental dreck is the kindest thing I can say about it. As for The Blue Castle, it’s one of my favourites. LMM used her heroine as a vehicle to say all the things that she, as a minister’s wife, had to keep her lips sealed about (actually, she used her journals as such too, but they were not to be published in her lifetime). But does anyone really believe for a moment that Valancy is doomed to an early death? The reader knows she is safe, and we enjoy watching her change her the way she lives her life. Our reading tastes definitely evolve. I’m having a similar experience with Gene Stratton Porter – I loved “Freckles” & read & reread it all through my youth. I found it in a box of my old books when I was clearing out my mom’s house some years ago & gleefully brought it home, only to find that the old magic was just not there anymore. Just finished Blue Castle – it was quite easy to locate – I have all the LMM in one place – stayed up late & got up early & did it in one fell swoop, as it were, triggered by this conversation we’ve got going here. I’m going to give it the nod. It was sweet & funny & ultimately happy-making – a great contrast to Kilmeny!